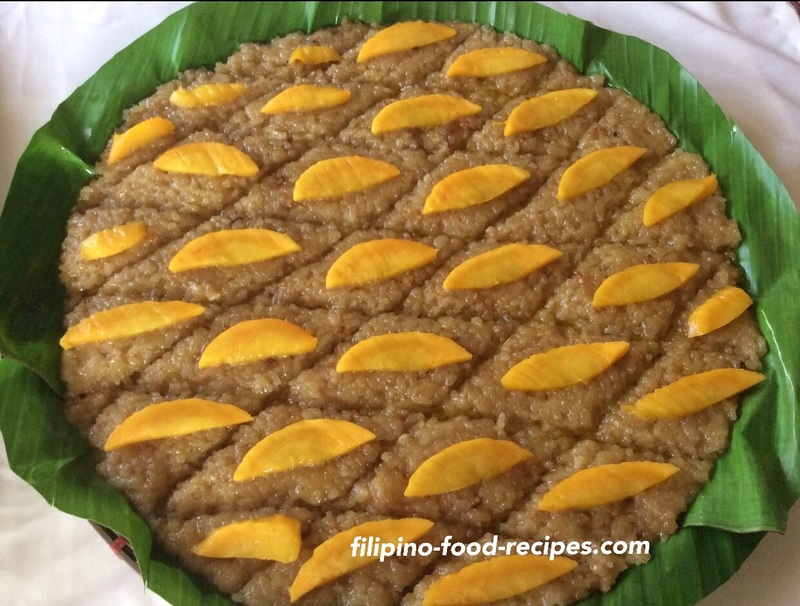 Biko mangga is a ripe mango flavored sweet rice cake that I just thought of cooking together. I was thinking we can love suman and mangga, why not do biko and mangga? It started when I had a lot of mangoes getting ripe all at the same time, so I had to think of other ways to use them. I sliced a couple, put them in the blender and added to the biko I was making. Not sure if it would work, but it did-- so good, my family loved it. Come try making my Bico Mangga and bring it to your next party gathering. 1 Cook the glutinous rice like how you would the regular steamed white rice or cook in rice cooker with 3 cups coconut water. Fluff and cool for a little bit. 2 Peel and cut the 2 mangoes around the pit, slice into chunks, add 1 cup water and put in a blender. 3 Bring the coconut cream and water to a boil, add the blended mango and the sugar. 4 Add the glutinous rice and mix until the liquid is fully absorbed and hard to mix and the consistency is chewy. 5 Spread on a tray, cut in crisscross portions then top with slices of mango.